Stella Grundy, former lead singer of Intastella, has forged a successful career in acting since her band broke up at the end of the last century. The Rise And Fall Of A Northern Star is the soundtrack of her latest venture, a one-woman play that she's touring around the UK at present. Stuart Ralston, a big fan back in the day, checks out the album to see if it rekindles his flame. Back in the early '90s, Manchester was the music capital of the world (of course, it still is and always will be). Bands such as James, Inspiral Carpets, The Mondays and The Roses were at the head of the scene. In additional, a whole host of other bands were forming, getting signed up before playing a gig, and gaining front covers of the music weeklies before the ink on their contracts had dried. Some bands were bandwagon jumpers. Some were chancers. Others were bona fide pop stars. Intastella were one of the latter. Formed from the ashes of one of Inspiral Graham's favourite bands (Laugh), they were real contenders and fronted by one of the most enigmatic front women of their generation. The band were Intastella, fronted by the multi talented Stella Grundy. I was lucky enough to catch them play to packed houses in Glasgow back in '91 and '92. Intastella had it all. The look, the persona, the groove, and unlike many of their contemporaries, they had a substantial back catalogue, releasing a whole host of pop-tastic singles and three albums (Intastella and the Family of People in 1991, What You Gonna Do in 1995 and Nuphonia in 1997). Unfortunately, they never reached the levels of success that bands with a similar philosophy had such as Pulp, their biggest hit single being The Night, which stalled at number 60. Following their split, Grundy moved into acting, winning acclaim for her portrayal as Nico. 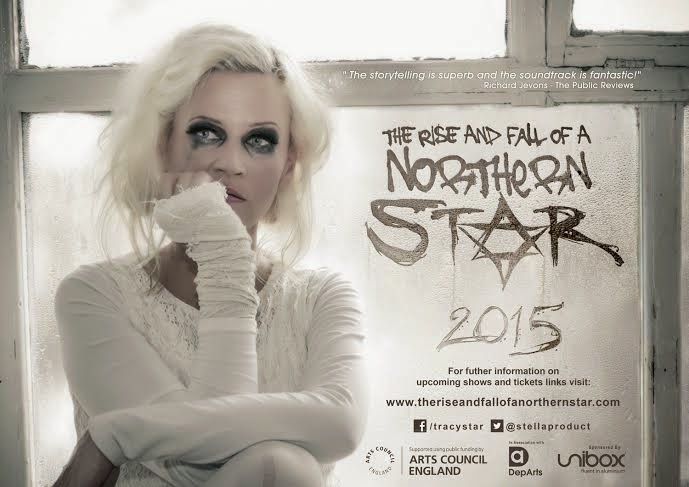 In recent years she has won rave reviews for her one woman play The Rise and Fall Of A Northern Star. The play tells the story of rock 'n' roll wannabe Tracy Star, who is trying to make her mark in the male-dominated Manchester music scene of the 1980s and 90s. This (long overdue) new record is her soundtrack from that play. Opening with Moon, and I manage a smile. That distinctive, unmistakable voice is still there. With Stella half singing, half speaking, and some swirling pop sounds this is the perfect reintroduction. High follows in a similar vein. There's a familiar Intastella / World of Twist ambiance to High, although more chilled out, and tells the story of Tracey Star's drug excesses. Star continues the narrative of life on the road, set against an upbeat Pulp / Primal Scream soundscape. King Tut's Wah Wah Hut, where I witnessed Intastella over 20 years ago, even gets a name check. 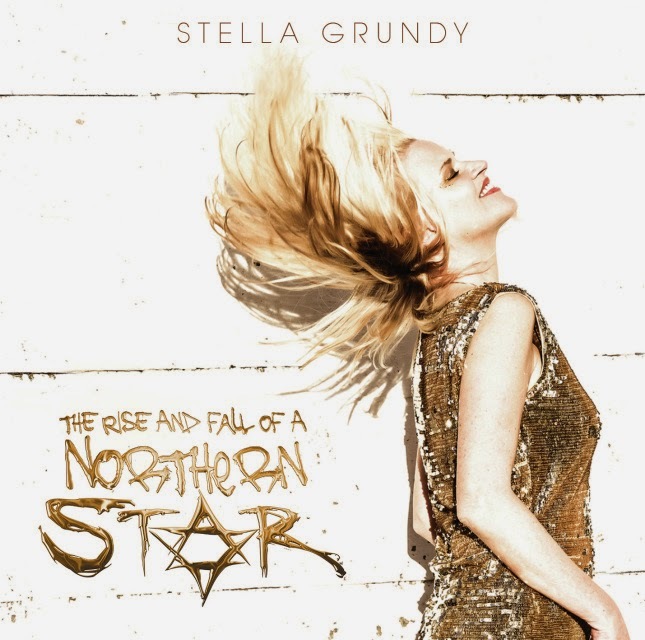 Depending on your viewpoint, Stella either paints a bleak picture of the rock n roll lifestyle or a hedonistic one on Star. Lucifer is a slightly darker, comedown number. Goodbye is a curious departure in style. It's almost a sea shanty! Escape Hatch is another laid back, late night chill out song, devoid from the bubblegum pop of earlier tracks. Blow Me has a harder edge and features a commanding bass guitar from the legendary Jah Wobble. Stella sings as though she's a Mancunian Patti Smith. Heavyweight is the most upbeat track on the album with a laidback vocal from Stella. It is probably the most Intastella-esque song presented here and is easily the pick of the album. Just A Girl is a piano driven, simple, yet timeless tune and one of the highlights of the LP. For me, Grundy's voice has never sounded so good. 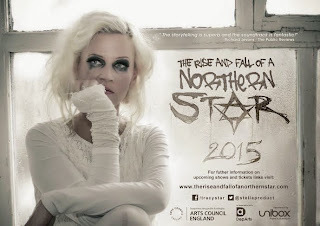 Details of how to order The Rise And Fall Of A Northern Star can be found on the play's website, including all upcoming dates. Stella is on Facebook and Twitter.